The Angry Video Game Nerd takes a dump on the game. Literally. That kind of reception makes me think he actually enjoyed it quite a bit. It’s a classic AVGN nerd review. 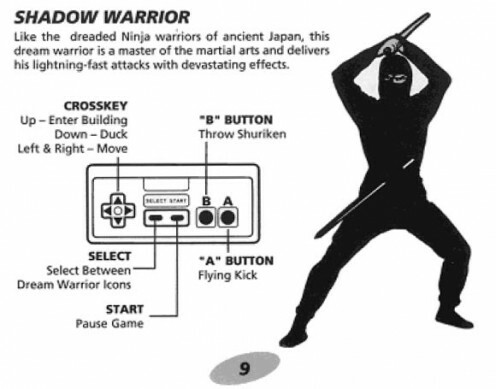 Now that we’ve had an entertaining overview of the game, check out the manual. Here are some highlights. Or lowlights. Wait, what? A Shadow Warrior? It looks more like a teenager in black sweats and a ski mask. An acrobat? Did LJN find these graphics in a clip art book? The Necromancer looks like she’s wearing a robe made of children’s bed sheets, which makes sense considering they fight Freddy in the dream world. She also looks like she’s about to sneeze. As if the bad news about this game was not already apparent, the developers kindly included this handy appendix. 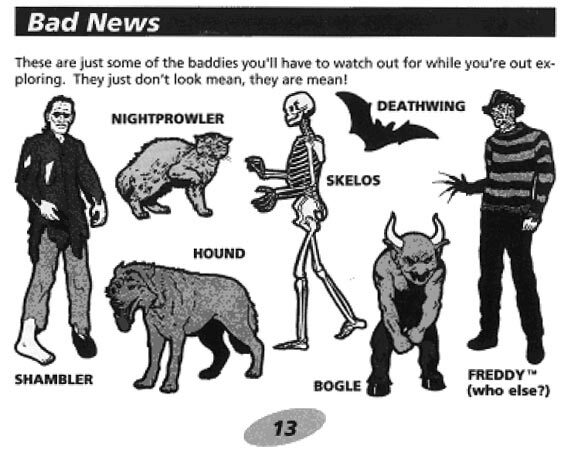 The clip art here looks like it came from the Halloween section. The image of Freddy is clearly a modified image of a normal person with his head changed and the gloved hand placed behind him. Clever. Bogle: My brother was in Labyrinth! Deathwing: Puny mortals! I have had many names throughout history, all of them spoken with dread: Neltharion, Xaxas, and many more. Yet you shall know me best as Deathwing, for so I am! I am the bane of life, the darkness within history, the lord of death, the master of destruction. And I tell you now, and so it is true, that this world is mine!